Villas of Wake Forest is a 55+ community in Wake Forest, North Carolina. This active adult neighborhood features tree-lined streets, green spaces, and will consist of only 144 residences, which make it easy for neighbors to become fast friends in a close-knit environment. A charming clubhouse is on-site and is the perfect place where neighbors come together to socialize and have fun. Residents enjoy living in a carefree community that handles exterior-home maintenance so they can spend time pursuing social activities and events with friends and family. Homeowners have plenty of options for shopping and dining in Downtown Wake Forest, NC. This quaint town also offers easy access to major highways to Raleigh and Durham for additional entertainment, museums, medical facilities, and attractions. 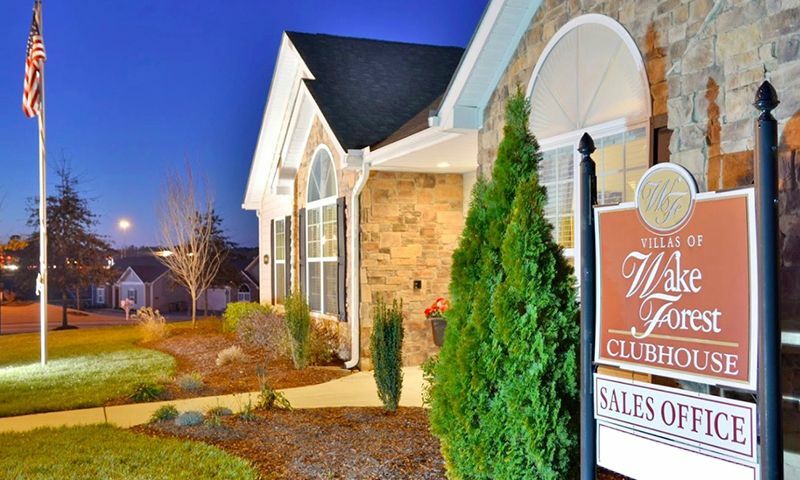 Residents enjoy an active and social lifestyle in Villas of Wake Forest. This is made possible because of the well-appointed clubhouse, which is the heart of the community. Here, homeowners stay fit in the exercise room. They can gather with neighbors in the meeting room, TV lounge, or catering kitchen. Neighbors challenge each other at the billiards or card tables for a fun game night. Outdoors, homeowners can take a dip in the pool or enjoy the sunshine while lounging on the patio. They can prepare delicious meals using the BBQ area for special celebrations. Neighbors can challenge each other at the bocce ball court or practice their short game on the putting green. Homebuyers can choose from four unique floor plans. These attached homes offer 1,563 to 1,860 square feet of living space. They have two or three bedrooms, two or three bathrooms, and an attached two or two-and-a-half-car garage. All homes are single-story and some models can be personalized with optional second-floor bonus suites. These homes feature open layouts, inviting kitchens, private patios, courtyards or verandas. Residents will have a full social calendar while living in Villas of Wake Forest. This vibrant community often hosts events like movie nights, holiday gatherings, informative gatherings, and potlucks. Homeowners can mingle with friends and family in the clubhouse or host parties at home and invite neighbors to build lifelong friendships. They can start a new club or hobby to bond over similar interests. There is something fun for everyone at Villas of Wake Forest. Nestled within the beautiful and charming city of Wake Forest, Villas of Wake Forest provides a natural and quiet neighborhood setting for active adults. The area has local shops, restaurants, and medical facilities nearby. Some of those include The Shoppes at Caveness Farms, Walmart Supercenter, Target, Lowe's Home Improvement, and Wakefield Commons. Route 1 and Highway 98 provide easy access so residents can get around town quickly. Medical facilities are just a few miles away such as Rex Healthcare, Wake Med Raleigh Hospital, and Wake Medical North Campus. Golf courses close by include Paschal Golf Club and Brevofield Golf Links. For big-city entertainment, Raleigh and Durham are each about 30 minutes away. When traveling farther is necessary, Raleigh-Durham International Airport is less than 40 minutes away. With so much to do in and around the Raleigh-Durham area, active adults will find Villas of Wake Forest the perfect 55+ community to call home. There are plenty of activities available in Villas of Wake Forest. Here is a sample of some of the clubs, activities and classes offered here. Homebuyers can choose from three unique floor plans. These attached homes offer 1,563 to 1,860 square feet of living space. They have two or three bedrooms, two or three bathrooms, and an attached two or two-and-a-half-car garage. All homes are single-story and some models can be personalized with optional second-floor bonus suites. These homes feature open layouts, inviting kitchens, private patios, courtyards or verandas. 55places.com is not affiliated with the developer(s) or homeowners association of Villas of Wake Forest. The information you submit is distributed to a 55places.com Partner Agent, who is a licensed real estate agent. The information regarding Villas of Wake Forest has not been verified or approved by the developer or homeowners association. Please verify all information prior to purchasing. 55places.com is not responsible for any errors regarding the information displayed on this website.